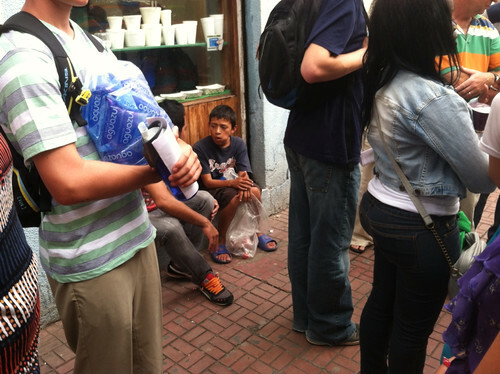 There are two prominent figures that overlook the market and downtown Tegucigalpa, Honduras. The first, El Cristo del Picacho, is located in a beautiful park with an incredible view of the capital city. 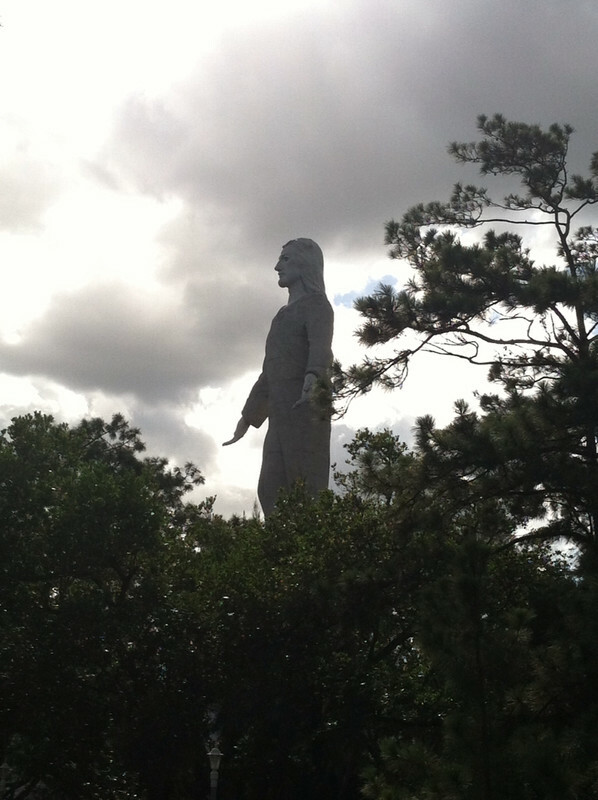 It costs 10 Lempiras (roughly $.50) to see this Jesus, which seems to debunk any theology about salvation being free. The second is a yellow house on the opposite hill, which is home to one of the more prominent drug lords in Honduras. Everyone knows he lives there; he simply has paid-off police and other law enforcement to ensure security for his residence and dealings. In between these two cultural "icons" is a plaza buzzing with activity. The streets of this plaza serve as residence for many of Honduras' most marginalized and ignored. There are the "glue boys," homeless youth who flee domestic distress and develop addictions to yellow shoe glue that provides a cheap daily high. Most pay no attention to kids like Mil Años, a young boy nicknamed for his aged face that results from his addiction. Micah Project, instead, calls them family and extends them invitations into their community where they can be lifted from addiction, receive an education, and discover the love of God in Jesus. The plaza is also home to a young leper, who sits at the main entrance of a Catholic Church. Our youth took notice and offered him hot food, cold water, and quite possibly the only expression of hospitality and affection he encountered all day. Talk about a story that will preach! Then there are the severely physically handicapped, aged "glue boys," homeless old women, and a long line of others. As our youth walked with leaders from Micah Project throughout the streets of this Honduran Central Park, stories of Scripture came alive. It was almost too much for some of our youth. It is true, Honduras is a country in distress. The nation is plagued with political corruption, insufficient education, significant malnutrition, pervasive poverty, increasing drug-related violence, and a police force confused about who to defend- drug lords or vulnerable citizens? It is also true that beauty, love, and hope are sprouting up like mango trees in the back yards of Guaimaca homes, an hour outside the urban center. If we are not paying careful attention, we may miss these stories and the sweet attestations to the kingdom of God falling from their branches. Each day of our evolving youth-to-youth partnership in Honduras began and ended with cross and resurrection stories. Youth were invited to share where they encountered suffering and despair and where their eyes and ears were opened to signs of God's hope and redemption. I am convinced this should become a daily, personal and corporate discipline. The temptation is to either fix our eyes on Cristo del Picacho and forget the drug lords wreaking havoc behind us or be overwhelmed by the drug lords and others just like him, unaware that Jesus has entered into real human suffering and promised all of us new creation. The call of disciples of Jesus is to live in the spaces between Picacho and that yellow house on the hill, or at least make pilgrimages of partnership there, with an honest and awakened hope that this new creation can and must begin now. And I am firmly convinced that this especially begins though the youth of our respective communities. Retreating Together: We spent the weekend together with over 200 youth and related adult leaders at a retreat center adjacent to the largest lake in Honduras. While the flavor of the liturgy and preaching was more charismatic than most of our youth and their youth pastor are accustomed, the love for Jesus, one another, and a passion for transformation in light of the gospel was not able to be overlooked. The Presbytery of Honduras is beginning to emphasize the role of youth in their congregations and communities and the result is a growing populous of young people who are interested in being part of the personal and social change that comes when we follow Jesus. This retreat also provides a well-needed weekend of play and celebration for youth, both in Honduras and Pennsylvania, often weighed down by a variety of pressures and anxieties. Shared Mission and Eco Stoves: Our partnership began with an emphasis on one of my favorite mantras, "it's not always about what you do, but who you meet." However, once you get to know people and call them family, you eventually must "do things" together. 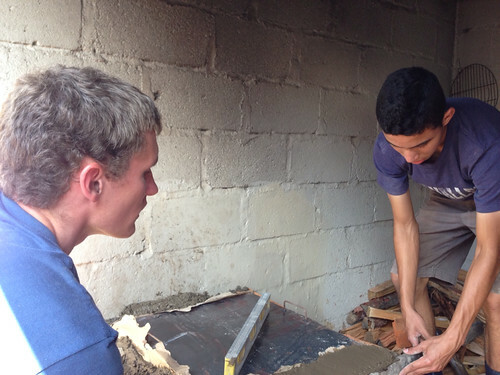 This year we emphasized shared mission and constructed two eco-stoves alongside youth in Guaimaca. The Presbytery of Honduras developed a project whereby they rip out old stoves, which use significant amounts of wood and lack proper ventilation, and replace them with a fresher design that not only saves money and cares for creation, but also enhances the health of those who utilize these brick stoves by transferring the smoke outside the home and/or outdoor kitchen. Imago Dei Youth served alongside younger members of the church who were empowered to serve their neighbors as they developed new and eco-friendly skills that can transform the health of their community. Our youth were also invited to consider how they can develop simple, yet significant expressions of love and generosity in their own communities back home. Micah Project and Heifer International: I continue to be left in awe as we learn and converse with our friends at both of these extensions of God's concern for the poor and marginalized. The same rings true for organizations like Association for a More Just Society. Disciples of Jesus have radically surrendered their lives to God's call to work towards the reconciliation and redemption of both people and corrupt systems. Micah Project continues to receive boys from the streets and transform them, by the power of God's Spirit, into faithful and productive members of their communities. Heifer International offers the poor means to earn a living, provide for the families, empower women, and be lifted from cycles of despair and oppression. Those who serve within these ministries are heroes in my eyes and the eyes of all of us who learn and serve alongside them. Foot Washing and Partnership: The week ended with, as one of the Honduran youth leaders remarked, a traditional Honduran youth ministry meal- pizza! But it ended with a not-so traditional encounter, a re-telling of John 13 and Jesus' washing of the disciples feet. As the youth were finishing the meal, we did what Jesus commanded his disciples to do, Hondurans washing Americans and Americans washing Hondurans. The youth, surely like the first disciples, were confused at first. They then began to wonder, is this not the truest expression of partnership? I think so, "Very truly, I tell you, whoever receives one whom I send receives me; and whoever receives me receives him who sent me" (John 13:20). Indeed, partnership is all about receiving one another and, in turn, receiving the ONe who sends us both. Ephesians and Youth Mission as Biblical Hermeneutics: Like Proverbs makes for a great daily reflection over the course of a month, Ephesians provides a great meditation for a week away in Honduras. Each day began and ended with reading a chapter from this beloved letter, providing a platform for biblical and cultural hermeneutics for youth. This letter is both beautiful and difficult, promoting unity and causing pause when we consider words like submission and slaves. Raw and honest questions were encouraged and the language of this letter felt as though it was written to us and for us as we spent a week together as a youth ministry in Honduras. We must never under estimate the spiritual maturity and thirst for depth of teenagers in our churches. I learned a lot from them this week! I pray they learned something from me, too. Just love this post, Greg. The symbols overlooking the city are a really poignant picture of the tension I feel between despair at the pain and injustice and suffering around me, and hope and freedom and liberation in Christ that I wish to share. glad it was a meaningful read. the symbols were moving to me, too, and this partnership is a joy o be a part of! So much of what I do in youth ministry mission has been framed by our DR partnership. hope you are well!